Rating: Average 4.54 / 5 out of 57 total votes. Summary: It's the spring of freshman year, and Kanji Sasahara is in a quandary. Should he fulfill his long-cherished dream of joining an otaku club? Saki Kasukabe also faces a dilemma. Can she ever turn her boyfriend, anime fanboy Kousaka, into a normal guy? 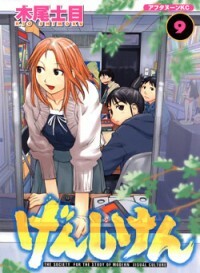 Kanji triumphs where Saki fails, when both Kanji and Kousaka sign up for Genshiken: The Society for the Study of Modern Visual Culture.